Each month Parragon send me a cookery book to review. I love to try out new recipes on a regular basis, and cookery books are such a true passion of mine: for me, this is the perfect job! This month I've been sent The Clean-Eating Kitchen and it couldn't have come at a better time. I've been fascinated by the idea of eating 'clean' for a while now, and have read a lot about it. I have good friends who are committed to a cleaner way of eating ("Hi!" to Liz and Amy who are totally welcome to borrow this book!) and so I couldn't wait to dive into this book! A beautiful full colour 128 page book filled with delicious healthy recipes to keep you clean! Clean-eating doesn't just mean washing your lettuce before you make a salad but eating foods that maximize their nutritional benefits by serving them in their most natural, whole state - and this book makes it easy! The helpful introduction will guide you through what processed ingredients to replace in your diet and each meal of the day is covered by a variety of exciting dishes. The recipes are simple, approachable, and made with raw natural ingredients that are easy to find in your favourite supermarket, health food shop, and farmers market and what's more they taste great. I love this book. As someone who was interested in clean eating but knew very little about it, it was the perfect introduction to this eating concept. The book is broken down into sections, all of which combine to give you a comprehensive overview and insight into the world of clean eating. 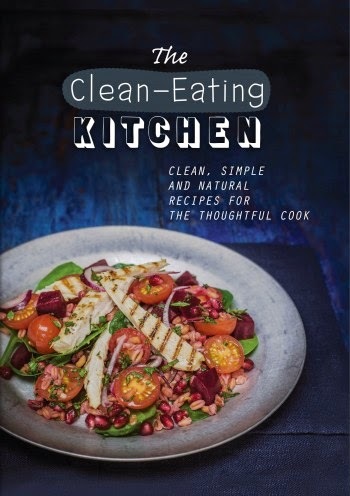 Having read this book from cover to cover I have decided that I definitely want to make a commitment to myself to try to eat in a cleaner way as much of the time as possible: not only to help me to maintain my recent 6 stone weight loss, but also to help keep my body and mind at the healthiest it can be. I am realistic however, I know myself, my own eating habits, my 'weaknesses' when it comes to food, and I know that I would be unable to commit to a completely clean diet 100% of the time. I can however make small changes to my already balanced diet to clean it up and make it healthier. I couldn't wait to try a recipe, and give this book a little road test in my own kitchen. When I saw the recipe for Raw Chocolate Ice Cream in this book, I was instantly intrigued. My husband Liam is a BIG ice cream fan, but obviously because of its high sugar/calorie content we don't often eat it anymore. We love a sweet treat, so I was fascinated to know whether this 'raw' ice cream was any good - could it give hubby's highly calorific double chocolate real ice cream a run for its money? The answer: YES. It is DELICIOUS, so easy to make it is almost embarrassing, and it really is a truly scrumptious, unctuous and deeply chocolatey sweet treat. It comes in at 95 calories per portion, and is made up of completely natural ingredients. 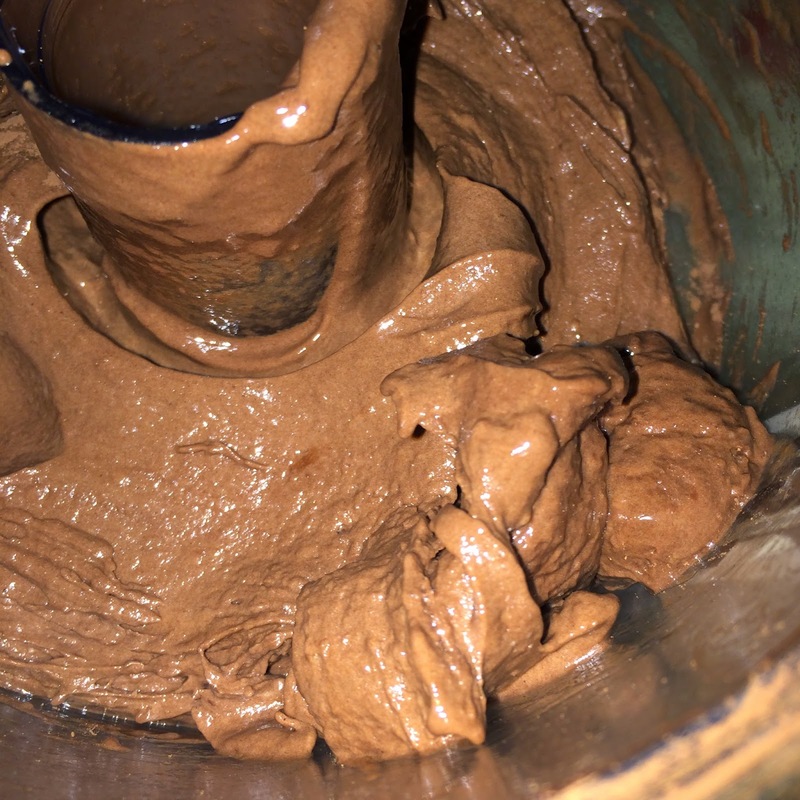 The recipe is a mixture of frozen bananas, good unsweetened cocoa powder and agave nectar or honey - all whizzed up in a food processor until its a smooth Mr Whippy-like consistency. Serve immediately for a soft serve ice cream, or refreeze for an hour for a firmer scoopable ice cream. We served ours at the soft serve stage, with fresh berries and a couple of crumbled Amaretti biscuits over the top to add texture. The amaretti biscuits are not a 'clean' food, but they are very low in calories and easy to portion: for me, it is all about learning to eat with balance: the raw chocolate ice cream is SO much healthier than a high sugar dairy dessert, so adding a little crumbled biscuit is no disaster in my eyes. 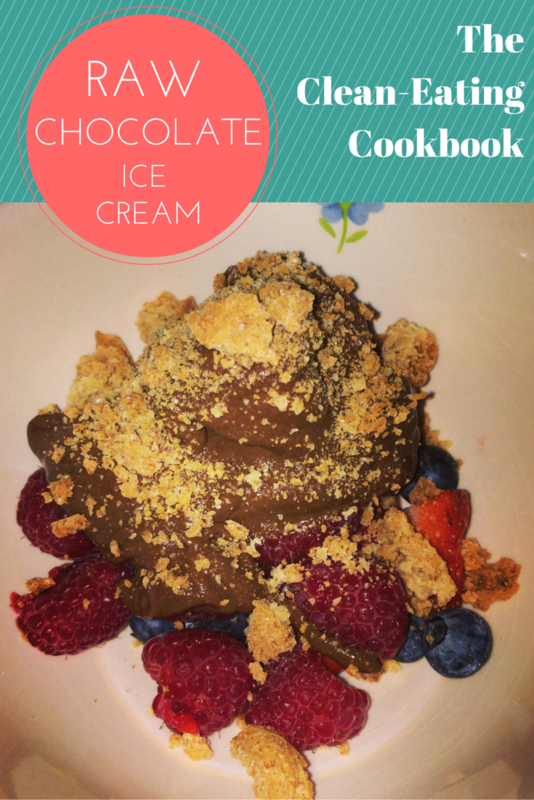 Scrumptious chocolate ice cream with fresh berries and amaretti biscuit crumble. I love that I am learning how to enjoy delicious sweet treats in a much cleaner and healthier way, without forfeiting any of the flavour thanks to this Clean-Eating Cookbook. I highly recommend this book to anyone with an interest in improving their health through diet. This comprehensive collection of simple recipes with easy to source ingredients, is the perfect starting place for a cleaner eating lifestyle. Disclaimer: I was sent a copy of The Clean-Eating Cookbook for the purpose of this review. All words, opinions and images are my own.